Today was the annual Thanksgiving assembly where all the Kinder classes sing a selection of songs and recite some poetry. Benjamin has been rehearsing one song in particular which is sung to the tune of "The more we get together". It basically goes: Gobble, gobble, gobble, gobble, Fat Turkey, Fat Turkey... and then the rest is garbled. Around campus I've heard the older classes making up their own lyrics to the little ditty. There are seven Kindergarten classes this year. Two dressed as Pilgrims, two as turkeys, and three as Native Americans. 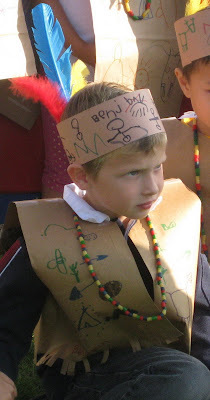 Ben's class had the most ornate costumes, with real feathers in their headbands and hand dyed macaroni beads. Benjamin is a star performer, singing loudly and doing all the hand motions with military precision. I think the most amazing part of the assembly was the incredible respect that all the other students showed to the performing Kindergartners! 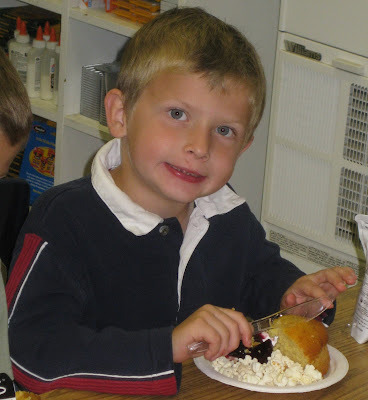 After the assembly, Ben's class had a mini "feast" where they enjoyed cornbread, cranberry sauce, popcorn, and hand churned butter (which was primarily churned by yours truly). When I picked Ben up from school he had a big, happy smile on his face, and he told me he'd had a great day. I asked him to tell me his most favorite thing for the day. When they let me use the knife to spread the butter!, he practically sang. Go figure. Maybe we'll let him carve that Fat Turkey on Thursday! I totally remember doing this when I was in Kindergarten!! Infact, I know look at other schools and say "how come you don't do a halloween parade?" or "how come you don't dress up for Thanksgiving?". Hickory has set the standard high for me.